While shoveling the snow he finds a letter in the mailbox; no stamp, no footprints in the snow from the deliverer. Mack is confused. Papa is the name his wife Nan, played by Radha Mitchell, uses for God. He goes to his neighbor Willie, played by Tim McGraw, to accuse him of leaving the note. Finding out that is wasn’t Willie, Mack begins to plan a trip back to the shack where Missy was killed. It’s a cold snowy day when he gets to the shack, which is in shambles. He falls to the ground and breaks down, crying for his Missy. When he gets back up and starts walking to the truck, he encounters a man walking in the woods. The man invites Mack to follow him, saying that he is glad that Mack came. As Mack follows the man he sees the sun ahead, the grass, flowers and trees blooming. Once at the shack he sees that it is a beautiful place. Going inside he meets Papa, played by Octavia Spencer, the Holy Spirit Sarayu, played by Sumire Matsubara and realizes the man among them is Jesus, played by Aviv Alush. The story goes on with the Holy Trinity helping Mack to deal with all of his feelings with the death of his daughter. He questions the evil in the world, the pain people suffer, and faith. 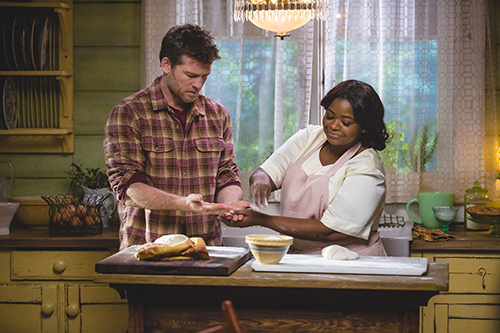 The Shack is a very moving story. It follows the book very closely. It’s long, but held me in its grip, making me look at my faith.